I recently went to a cocktail party where the hostess had served roasted figs in balsamic vinegar and honey. They were delicious. Â The presentation looked so warm and welcoming. She paired it with roasted almonds and blue cheese with slices of bread. The flavors were amazing. This was something that was a simple to prepare and wonderful to serve to a large or small group as the weather is starting to turn colder. 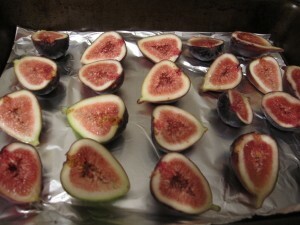 On a jelly role sheet (a cookie sheet with sides) or baking dish place cut figs. In a saucepan heat 3 tablespoons of Vinegar, Honey, Sugar Cinnamon, and Olive Oil and cook until simmering. Evenly cover the figs with the sauce and place in oven for 30 minutes then take out every 10 minutes and brush with vinegar. 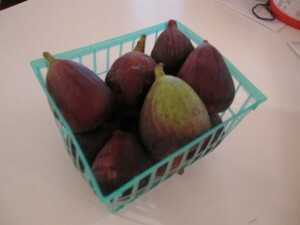 Take out when figs are nice and tender! Ready to serve. Things that are paired well with Figs: Almonds, Anise, Blue Cheese, Chocolate, Cinnamon, Goat’s Cheese, Hard Cheese, Hazelnut, Mint, Orange, Prosciutto, Raspberry, Soft Cheese, Vanilla, and Walnut. I can remember the first time I had a Croque Monsieur vividly. I was 8 years old, had just moved to Tokyo with my family, and come back from school orientation and while waiting for my mother in lobby seating area my father ordered one for us. He was so excited to see it on the menu. 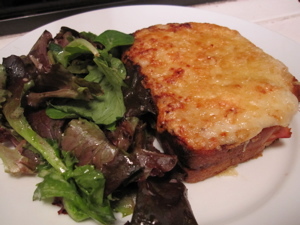 I think to this day it is still the best croque monsieur; I have ever had. Recently, in the past year I have been on the quest to find one that compares. I have found one that competes but thought I would indulge and try it on my own. I have seen them cut up small and served as hors d’Â oeuvres. Which I think is an awesome idea. What makes this different from just a ham and cheese sandwich? The Bechamel Sauce. I never would have thought to put a sauce in a sandwich, but oh how it makes it delicious! Lightly and evenly butter on both sides of bread and toast both sides in saute pan over low heat until just golden brown. If you decide to use Dijon Mustard spread one side of each toasted slice with mustard. Evenly place the ham slices and about ½ cup Gruyere cheese on two of the bread slices. Top each with one of remaining bread slices, mustard-side down. Spread bechamel sauce to cover the top of each sandwich including the crust. Sprinkle evenly with the remaining Gruyere cheese and Parmesan Cheese. Place on a pan and bake for 5 minutes, then place under broiler until cheese is bubbling and lightly browned, about 3 minutes. Melt the butter in a saucepan. Stir in the flour and cook, stirring constantly, until the paste cooks and bubbles a bit, about 2 minutes, do not let it turn brown. Add the hot milk, continue to stir, the sauce will thicken and bring to a boil. Add salt and pepper, lower the heat, and cook, stirring for 2 to 3 minutes more. Remove from the heat and stir in the Gruyere Cheese. I saw Julie and Julia the first day it came out. I don’t think, I was the only person that was then intrigued to make Beef Bourguignon and see what all the fuss is about. I made this recently, on a cold snowy night. This is the perfect dish for this kind of evening. 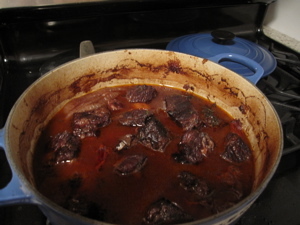 While making it I did not understand why there was all this fear in making the Beef Bourguignon. I think the fear comes from the fact that there are multiple steps and it takes a long time to cook. Also you do need a Dutch Oven to make this dish. Since it was the holiday season, I saw it as an excuse for me to finally buy one. This is something that could be made the day before and I think, actually tastes better the next day. Also a perfect dish to entertain with in the winter since it can be made ahead. It is very hardy. Simmer bacon for 10 minutes, and then drain water and pat try. In Dutch Oven/Casserole Fireproof Dish saute the bacon and olive oil for 3 minutes. Remove bacon and set aside. Heat oil and saute beef until browned, do this a few pieces at a time and when browned on all sides with bacon. In the same fat brown all of the vegetables (except small white onions and mushrooms). 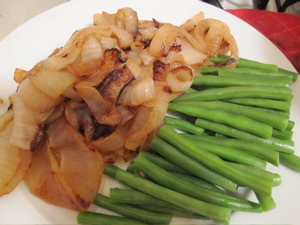 Once vegetables are lightly browned, pour out the sauteing fat. Return the beef and bacon to Dutch oven and toss with salt, pepper, and flour and place in oven for 4 minutes. Remove from oven and toss again and return to oven for 4 minutes. (This browns the flour and covers the meat with a light crust). Stir in the wine and enough stock so that the meat is barely covered. Add the tomato paste, garlic, and herbs. Bring to a simmer on the stove. Then cover the dish and place in oven for 2.5 to 3 hours. The meat is done when a fork pierces it easily. Boil the Small White Onions and then remove skins after cooked from onions. Cut Mushrooms into quarters and saute. When ready to serve distribute the onions and mushrooms over the meat. Definitely as the heat wave continues salad or cold soups are what I have been craving. Every so often I make something that I am truly excited about how it turned out. 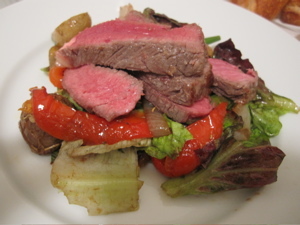 This Â is how I felt about this recent Steak Salad. I think I told just a few people, about 10 just how excited Iwas about it! Â I know it might seem like a lot of work, but I was able to accomplish everything in under an hour- I had a lot of things cooking at the same time. Unfortunately, I don’t per say have real measurements I just used what I had and tried to have equal portions. Also since I don’t have a grill I broiled my NY Strip steak for about 4 ½ minutes on each side. It did not have that beautiful grilled look but still tasted delicious! Extra- I roasted a garlic bulb to either be added to the salad or used on the bread. Before mixing all the ingredients together I cooled them all except the steak was served warm. Recently, I was given some fresh garden picked string beans. Growing up string beans were a staple in our house, although we really only ever had them served one way, steamed. 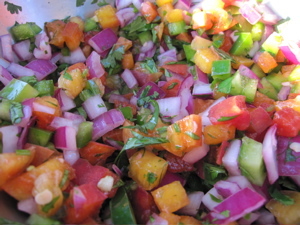 I thought I would make this more into a summer salad instead. Steam the string bean (about 2-3 minutes) and then quickly place in cold water to make sure they stop cooking. 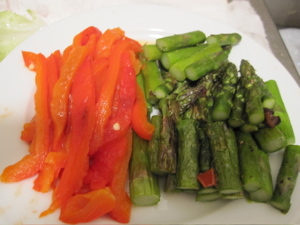 I chopped the Pepper finely but afterwards thought it would look nice if they were cut julienne style (thinly sliced lengthwise) and then chop the Shallot. 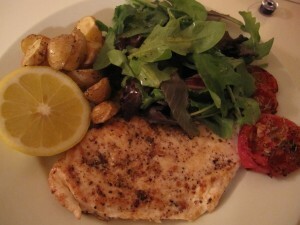 In a small bowl mix together Olive Oil, Lemon Juice, Mustard, and Salt & Pepper. (Start with one Lemon and then see if you need more and how much lemon you like- I am not a good gauge since I love LEMONS!) 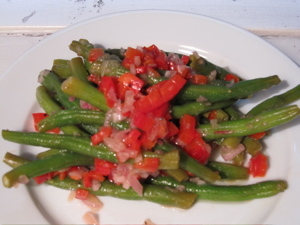 Now toss together dressing, string beans, shallots, and peppers. It also might be nice to add fresh tomatoes as tomato season is here. This is perfect for a summer BBQ! This is a different take on Pound Cake with Whipped Cream and Strawberries. This was a perfectly portable dessert that I made to bring to a picnic. 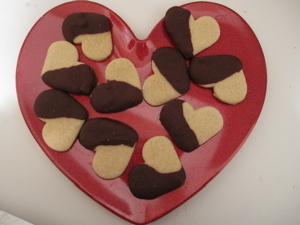 In a mixing bowl mix together Butter, Vegetable Shortening, and Sugar for about 2 minutes. Mix one egg in at a time and vanilla.Â Add the Flour, Baking Soda, and Milk alternating between the dry and wet ingredients. Fill cupcake cups about Â¾ of the way to the top and bake for 18-22 minutes until a tester comes out clean. Let cool completely before topping them with whipped cream. Makes about 15 Cupcakes. Dice up the strawberries and in a bowl toss them with the sugar- let stand for just a minute or so. In a separate bowl add the Heavy Cream, Fluff and Strawberry Mixture and beat until light and fluffy. Note: the cream did splatter a lot with the Fluff. 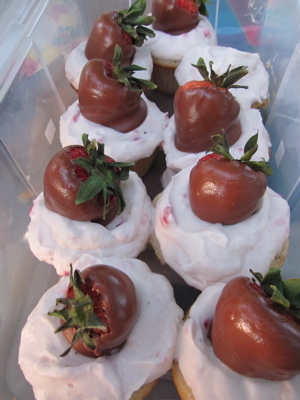 Top each cupcake with whipped cream; I finished them off by topping them with a chocolate cover strawberry. My apologies, the last entry had a some kind of computer glitch with only part of the entry. Here is the complete entry. 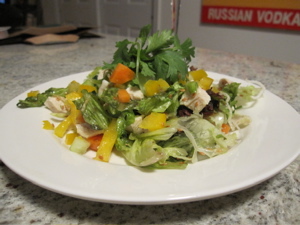 I love Chinese Chicken Salads, if on a menu I am always tempted to order it and look no further. The other thing that I love about them is that there are some underlying similarities but so many different kinds of variation that can be done. I think this is the perfect meal to have on a hot summer evening. Put all of the ingredients together in a pot and let cook on medium heat for about 15-20 minutes covered. Once chicken has cooked all the way through remove from heat and tear chicken into small pieces. Chill chicken before putting in salad. Mix all ingredients together. I find easiest to just put them all into a bottle and shape it up. Fried Maifun Noodles or Fried Wontons can also be added. In a large salad bowl add all ingredients except fried Noodles. Toss the salad with dressing and right before serving at the noodles.